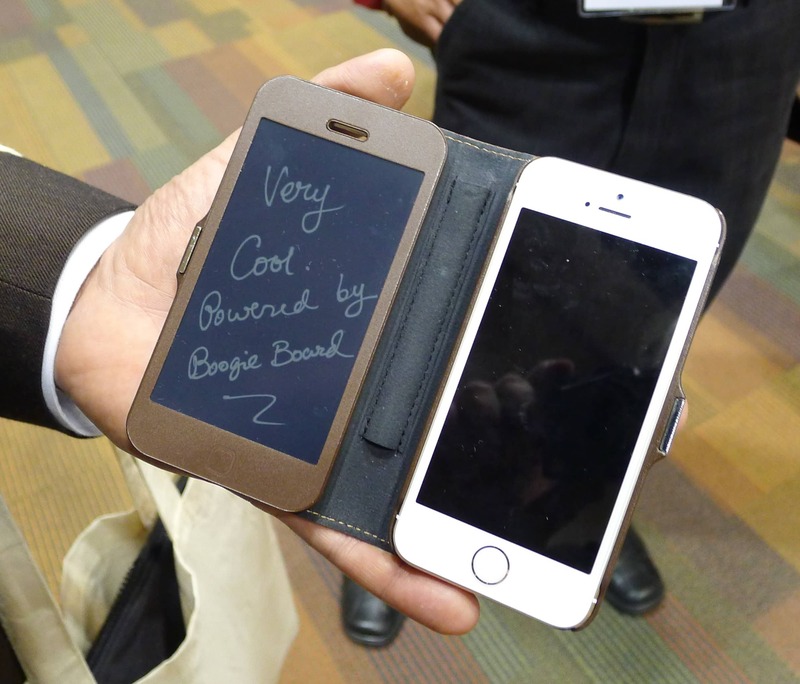 Pocketbook is wowing everyone with their CoverReader smartphone case, which adds an E-ink screen to a Samsung Galaxy S4, but they're not the only ones in the game. That is the Tegware Bagel. This device first debuted at CES 2014 (I missed it somehow) and it is currently available in South Korea and in Turkey. The Bagel sports a 4" Boogie Board screen on the left which can be used to scribble notes, but unlike some of Kent Displays's better writing tablets you cannot save the note nor transfer them to the iPhone. How exactly that is better than writing on the iPhone's screen escapes me, but the tech does look cool. Kent Displays is an Ohio based company that is best known for their Boogie Board writing tablets. These writing tablets use a unique Cholesteric LCD screen tech to enable users to take notes simply by writing on the screen. The screen require almost no power to operate, and in fact the only times the battery is used is when you are erasing or saving the screen contents. The Boogie Boards are available in a variety of screen sizes ranging from 4.5" to 10.5". The latest model has a 9.7" screen and can sync with a smartphone or tablet over Bluetooth. It costs $99.